Despite Poser's long history – (it's now 12 years old, with five separate publishers over the years) it seems there's still plenty to be done with the popular figure-posing package. Last year, current owner Smith Micro unveiled a Pro edition of the software, with network rendering and direct links into professional 3D-modelling software. Poser 8 doesn't offer those functions, but it does provide plenty of fresh ideas to entice newcomers and jaded long-term users. The surprises in Poser 8 begin as soon as you run the software: the quirky-but-functional user interface, which has been in place for most of the software's history, has been replaced with a far more conventional style. It's easy on the eye, with sober greys reminding you of one of Apple's design programs, and the tool palettes occupy less screen space than previously so that the Preview window is a decent size, even on a smaller monitor. The Library, which provides access to Poser 8's generous 4GB of bundled content and any third-party content you buy via the integrated online store, also sports a new design. Tracking down the item you want has never been much in Poser, and the approach here, similar to the List view in Finder, still demands lots of patient scrolling around. What a relief, then, to discover a brand-new tab next to the Library: Search. At last, you can simply type in the name of the item you want, click Search, and choose it from a results list. The feature is a bit sluggish in use, and a facility to add your own searchable descriptive tags to assets would make it more effective, but even this implementation is a clear move in the right direction. 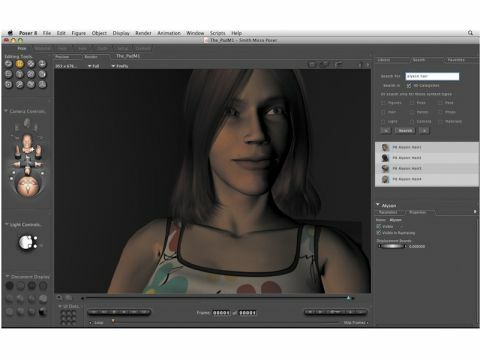 The confidence projected through the new interface is reflected in Poser 8's technical changes. Most tools feel more responsive, while the in-screen preview shows the effect of lights better, although it's still not accurate enough. Rendering is also improved, with indirect lighting adding detail to shadows that used to require lots of trial and error to achieve. Smith Micro has also created new figures: a male and a female, each in four racial variations. The emphasis on realism in Ryan and Alyson has mixed results: general proportions are good, but details such as the fold of the armpit area are unconvincing. The coming months will determine their real value, as content merchants decide whether they want to use Ryan and Alyson for their latest character and clothing designs. With overhauls above and below the surface, Poser 8 is a marked improvement over previous releases. Smith Micro has taken the same approach in Poser 8 that Apple has taken with Snow Leopard: there are relatively few brand-new tools, but there's been lots of tuning up to make what's there easier for newcomers to get into. It's more pleasant for regular users and more capable of good-quality renders with less fiddling. It'll be fascinating to see how Smith Micro builds on this solid foundation. There's a sting in the tale for existing Poser owners, though. An upgrade to Poser 8, even for owners of the most recent release, costs $130 (£80) – more than half the cost of buying the package new. Poser Pro owners can get Poser 8 for the same price, although the changes in Poser 8 will be reflected in Poser Pro 2010, which is due out later in the year.